One of the most essential components of the Marvel Cinematic Universe is consistency. Not just consistency in quality, but consistency in tone (action/jokes), consistency in casting (handsome white guys), and consistency in storytelling (villains who are a dark reflection of the heroes). There’s also a lot of consistency behind the scenes, which is why every MCU movie so far has either gotten a sequel or is a sequel. 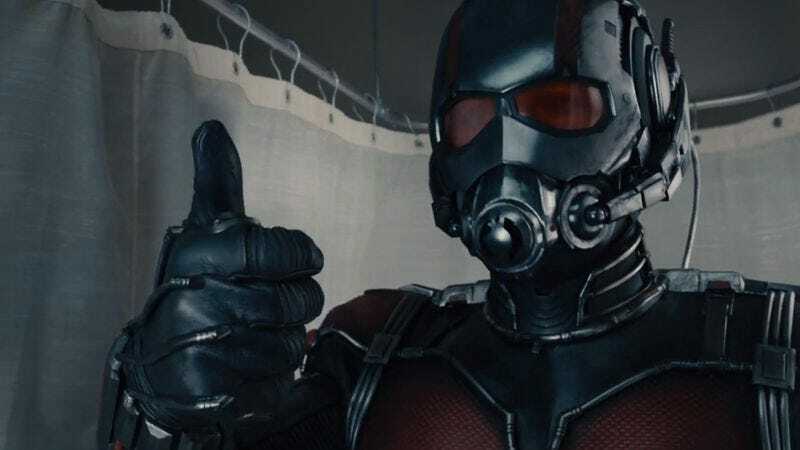 Unsurprisingly, this trend will continue with Ant-Man (a joke/action-filled movie starring a handsome white guy fighting a villain who was like him but evil), which Variety says will be getting a sequel in theaters on July 6, 2018. The most interesting thing about the Ant-Man sequel, though, isn’t simply that it exists (which is only mildly interesting). It’s that the film’s title will be Ant-Man And The Wasp, clearly a reference to Evangeline Lilly’s character from the first movie, who was presented with her own superhero costume in the post-credits stinger. Ant-Man And The Wasp’s release date is bumping the Black Panther and Captain Marvel movies back a bit (to February 16, 2018 and March 8, 2019, respectively), so Variety notes that this will be “the first Marvel movie named after a heroine.” Granted, she’s still only getting second billing, but that’ll hopefully be good enough to prevent her from being cut out of her own toy line like Black Widow was.